Beechwood thistle end 'porridge stick' used to stir oatmeal in the traditional way. It can also be used to stir anything from soup and mashed potatoes to milk puddings and custard. 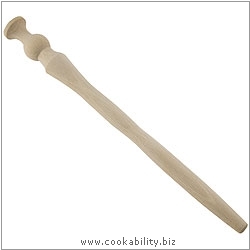 Most family spurtles were homemade with the end carved into a traditional emblem like a Scottish thistle. Spurtles originate from Scotland in the days when oatmeal was cooked overnight in huge pots that hung inside the fireplace.